Judge Dredd vinyl model kit. Box is open but contents are sealed/mint/complete with instructions. The Silver Surfer. 1/6th Scale Vinyl Model. From Dragon Models. The use of model kit techniques allow us reproduce the intricate details and sharp lines to maximize the usage of the official 3D character scans. Star-Lord is highly detailed and accurate, fully colored and textured to movie likeness, and requires minimal assembly. NIB Factory sealed parts bag. Instructions included. Box in very food condition. Sold as is. See pics. 3D Printed Flash Bust. Printed in Silver PLA. Produced by Moebius. THE DARK KNIGHT RISES. One Pod-Riding Batman. One Standing Batman. 1/25 SCALE. Release Date:November 2012. AS PICTURED. CHECK PICS FOR BETTER DETAILS,NO RESERVE! This is a resin prop model kit of the Walther P99 used by Pierce Brosnon in the James Bond series of films. Kit is cast as a single piece in solid black resin. Kit requires finishing and painting to make the completed prop shown on the box, resin kit finishing instructions are included. Kit is cast in solid, high-quality artist-grade resin, not 3-D printed material. Prop is full-sized, 1:1 scale, and measures approximately 7 inches long and 5 inches tall. This is a static prop kit with no moving parts and, of course, cannot be made to fire anything. Buyer pays calculated shipping by Priority Mail (US) or USPS Airmail (foreign). We combine shipping on multiple items. If you are purchasing more than one item, please wait for your invoice with total before paying to ensure you are getting the best shipping rate. Accurate likeness of Julie Newmar as Catwoman! SECOND IN A SERIES OF SEVEN KITS; FIT THE BASES TOGETHER TO CREATE A COMPLETE ENSEMBLE SCENE! Model Kit sets - Lot of (3). Standard E-Bay rules apply. You are buying what's in the picture. See the attached Picture(s). The CATTOYS Line of Film Authorized Collectible Prop Replicas. Material: ABS. Pieces are pre-painted and ready for assembly. This is a Dragon 38331 1:9 Iron Man 3 Midas Armor Kit. 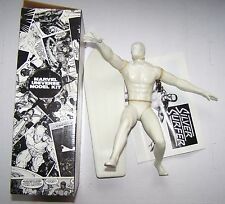 The Marvel Super Heroes model kit series from Dragon features blockbuster characters in 1/9 scale. Each stunning character is reproduced in model kit form allowing collectors and modelers to assemble their figures. The model figures are separated into as few parts as possible to ensure theyre extremely easy to assemble. Manufacturer: Dragon. Model Number: 38331. MSRP: 94.95. Category 1: Model Kits. Category 2: 1:12 (and smaller scales). Availability: Ships in 3 to 5 Business Days.